However, my Macros script is still needed; while the new version of Gmail does have additional keyboard shortcuts, it's still not possible to do everything from the keyboard. I've therefore ported it for the new version of Gmail, to install it, click below. For those of you adventurous enough to look at the script source, you'll notice that it uses a gmonkey object that is present on the window, which in turn gets you a gmail object with methods like getNavPaneElement() and getActiveViewType(). What this means is that the version of Gmail, in addition to being faster, also has semi-official support for Greasemonkey scripts. I'm pretty sure docs for this API will be out soon, but in the meantime, feel free to look at the script and use a tool like Firebug to investigate the properties of the gmonkey and gmail objects and play around. Update on 11/06/2007: And here are the semi-official docs. valleywag.com mail is handled by 1 aspmx.l.google.com. valleywag.com mail is handled by 5 alt1.aspmx.l.google.com. valleywag.com mail is handled by 5 alt2.aspmx.l.google.com. valleywag.com mail is handled by 10 aspmx2.googlemail.com. If I am interpreting this correctly, Valleywag's email is being handled by Gmail/Google Apps, which is slightly ironic. Having acquired an iPhone, I've been playing around with it to see just how much can be done with the "SDK" that is the MobileSafari browser. I thought it would be fun to see if I could make a simple game for it, since that's different enough from the kind of UI coding I do at work. Most of the games for the iPhone that I've encountered thus far were of the puzzle/card variety, and there wasn't anything too exciting/button-mashing/mindless. It seemed like this was mainly caused by the limitations of the events that the browser exposes. With no real mousemove events, and with mousedown events actually firing when the cursor was lifted (i.e. at the same time as mouseup), it was hard to get anything to happen on the screen quickly in response to a user action. One avenue that I tried was to have the screen covered in narrow vertical <div>'s, and to listen for click events on each of them. Unfortunately, while this worked when each was clicked separately (piano key-style), it didn't work when the user dragged his finger from one to another, since this would switch the browser into panning mode, even if the page/viewport was set to be only 320 pixels wide (i.e. no scrolling could actually occur). Since the viewport panning does not seem to expose any events, I thought that maybe there could be other ways of catching this user action. When scrolling quickly, the iPhone renders newly-visible areas with a checkerboard pattern before actually displaying their contents. I wondered if this meant that images contained in these areas would not be loaded until they were scrolled into view and rendered. If so, it would be possible to use a load event listener as a notification that the user had scrolled to a particular part of the screen. Unfortunately this didn't seem to be the case, images are loaded as soon as the document is displayed, even if they are off the screen. I then remembered that the iPhone supports an additional gesture, a two-fingered scroll that can be used to scroll text-areas, elements with overflow: auto and possibly other nodes. It would appear that scroll events trigger for this scrolling motion, meaning that it's possible to detect and get continuous updates for this. Though having to use two fingers seemed a bit clumsy, this seemed pretty promising insofar as it allowed for quick responses to user input. I had lofty goals for my iPhone game (I thought a vertical scrolling shooter was a good fit for the dragging input method and the vertical screen layout), but I decided that I should do something simple for my first attempt. I thought I would recreate aa racing game that I hard first played on my TI-82 calculator, where a car that can only be moved left or right moves at a constant vertical speed through a winding, narrowing road, with the objecting being to avoid hitting the sides. I thought this would map well to a horizontal scrolling motion that I could get with a scroll event handler as mentioned above. After writing a simple random road generator and the animation code, I was about to add collision detection. Out of curiosity, I tried to move the "car" left/or right as road moved by, even without collision detection, to see if the speed was too high. To my surprise, the road stopped moving as soon as I put my two fingers on the screen. It appeared that intervals (set up with window.setInterval) do not fire when two-finger scrolling mode is engaged. I thought that maybe I could refresh the animation from the scroll event handler, but that only seems to fire when there is actual motion, thus smooth animation can't be ensured. My failed attempt is visible here. Before pressing the "Start" button, use the two-fingered scrolling motion left and right to confirm the the "car" (the blue square) moves as expected. Then press "Start" and obverse the reasonably smooth animation. Unfortunately it all stops when placing two fingers on the screen again. This is rather disappointing, since there doesn't seem to be any fundamental technical reason why this should be the case. We're not talking about Mac OS 9 here (there, due to the way UI events were processed, normal event loop execution would be suspended while a menu was held open or a scrollbar thumb was dragged). It's quite clear, given what native iPhone apps can do, that the platform has quite a lot of CPU and graphics leeway. It's therefore unfortunate just how constrained the MobileSafari browser is, since just a few additional hooks would allow much richer interactions with the user. Someone forgot to read up on microcontent headlines. Sorry Bill Atkinson. I know you worked really hard to make regions and thus overlapping windows work. But since I now have 30 inch displays at both home and work, I've been tiling my windows and using Desktop Manager (and soon Spaces?) to switch between workspaces. Not having to deal with z-ordering makes mental context switches faster. Drip can provide some similar information for IE, and Leak Monitor finds some Firefox-specific leak types, but it would be good for browser/add-on creators to provide even more debugging information to authors. WebKit and Firefox/Mozilla both have publicly visible bug tracking systems. As they work on their respective new versions, regressions will occur that will break web sites, possibly including yours. Often, this is a genuine bug in the browser code, and hopefully it'll be fixed before the final release. However, it can sometimes be due to incorrect assumptions made by your code which no longer hold true when browser code is tightened up. Both WebKit's and Mozilla's Bugzilla instances support generating RSS feeds from search results. By subscribing to feeds for bugs that mention your product name, you can stay on top of such bug reports. For example, here's a shared page (with feed) for the bugs that mention Reader on either site. Opinion on Twitter is divided. What seems to be undisputed is that right now it's growing very quickly. I was curious just how "quickly" quickly was, preferably going beyond just anecdotal "my network doubled in size in the last 5 seconds" kind of observations. It seems like Twitter assigns globally unique, incrementing IDs to all messages it receives. 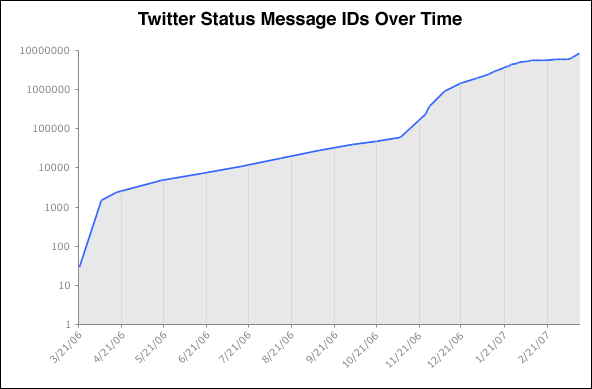 By looking at the values of these IDs over time, it's possible to see how many status messages Twitter is keeping track of. I've generated a logarithmic graph of this. I'm not sure why there was an inflection point in early November. It's also possible that this is affected by technical changes on Twitter's side. Still possibly interesting. Also, Joshua's post on autoincrement considered harmful is related and an interesting read. Update: As it was pointed out to me in the comments, Andy Baio had the same idea except he executed it more throughly. Blogger doesn't have any built-in entry importing facilities. My plan for dealing with this was to use their API to re-post all of the entries I had exported from Movable Type. A quick test showed that such entries could be back-dated, which was my main concern. Using some sample code that I found as a starting point, it was pretty easy to write a simple importing script for entries. Since I needed to parse the Atom responses from the API (e.g. to get at entry IDs), the Universal Feed Parser came in handy. Since I had used the Convert Line Breaks option on quite a few posts, I had to HTML-ify some post bodies before sending them to Blogger (I've turned off Blogger's similar setting. In addition to being only at the blog level, instead of a per-post setting, I've decided that the closer to regular HTML my posts are, the easier it will be to migrate again in the future). The Blogger API allows for posting of comments too, but unfortunately without the ability to impersonate others (even when anonymous comments are enabled). The solution was to impersonate the regular (non-API) comment posting form, which does allow for authors to be specified (but no backdating, which is why all imported comments are dated February 10th). This was made slightly trickier since a security token is required (to avoid XSRF attacks), so the posting page had to be scraped first to extract it. Finally, since Blogger proved to be occasionally flaky when doing many API operations in a row, I had to add some simple checkpointing so that if the process failed I could restart it and it would continue from where it left off. Once I did all that, importing 350+ entries and 600+ comments took around an hour, but worked flawlessly. I've uploaded an archive of my code that I used for the importing. It's not the cleanest it could be, but others may find it useful too. Additionally, in the time that has passed since I began my importing, it looks like a similar script has appeared that does a similar import operation from WordPress, which may be worth a look too. The first step in migrating away from Movable Type was to get all of my entries and comments in a structured format that could be parsed and uploaded to Blogger*. MT doesn't hold data hostage, there is a documented import/export format. Six Apart considers the format "lossy", in that it doesn't save a complete snapshot of your blog. I decided that what it did contain was good enough, though it turn out that what it lacked (entry IDs and permalinks) did make things slightly more difficult. A search on code.google.com for Python code to parse the format turned up Transfusion which does just that (searching for one of the magic strings in the format, CONVERT BREAKS specifically, was the easiest way to track this down). As I was skimming through the exported entries, I saw that they weren't quite HTML. I had used MTMacro to create various shorthand tags for linking to entries, reference to images, etc. Similarly, I used MTCodeBeautifier to pretty-print code samples. None of these were getting evaluated when exporting, and even if they had been, I probably would have wanted to tweak their output anyway (e.g. to change URLs). Generally, it seemed like the time I had spent customizing my Movable Type installation with cruft-free URLs, plug-ins, etc. would be directly proportional to the time I would have to spend migrating away from it. One of the more prevalent macros I had used was one of the form <entryLink id="NNN">foo</entryLink> so that I could link to my past entries. Unfortunately, since entry IDs were not included entry IDs issue, there was no easy way to turn these into actual links, since the exported information did not contain entry IDs or URLs. In the end, I ended up converting these by hand. That's it for the exporting part, part II will contain the Blogger import process and part III the template/design reasoning. * the other migration option that I was considering was WordPress. However, the idea of having to do SQL queries to serve traffic didn't seem that appealing given my current provider's slow SQL performance. WordPress.com would have been a hosted option, but if I was going to relinquish control of the installation, it might as well be to a Google product. Partly because I was fed up with Movable Type's rebuild times, but also for dog food reasons, I've moved my blog over to Blogger (custom domains was the final missing piece). Redirects should be in place and no links should break, but feed readers will most likely see a bunch of new entries (I didn't see an option in FeedBurner to suppress duplicates). Please leave a comment if you see anything amiss. I'll be writing up more details this coming week about the work that was necessary to migrate. That would have meant that the same tracking code can be used across all sites thus most users would have it cached (I think that's what Google Analytics relies on). Unfortunately, that's not something that I can change on my own. However, when running into a related problem (a FeedFlare was stuck on) it was pointed out to me that the i=... part of the script URL can be removed if all that's desired is the visitor tracking and not per-entry features like FeedFlares. This means that at least across my entire site there is only one tracking script URL that visitors have to load. It turns out FeedBurner documents this, but only in the "Others..." category (the bottom "If you want to use StandardStats only" section).